This weekend I had the pleasure of teaching two little girls how to knit. Lily and Violet had asked me to teach them how to knit after their mom saw this adorable homemade knitting nancy on Pinterest. I packed up a bag of yarn, we ate ten popsicles and got knitting. 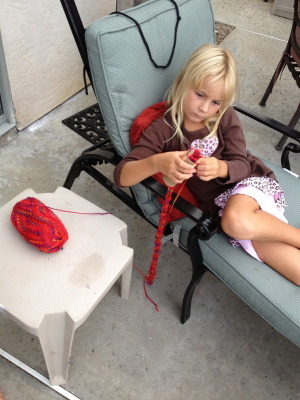 Lily is 7 and she picked up on the knitting nancy very quickly. Violet is 5 and struggled a little bit at first with the sticks so I taught her how to finger knit and she was off and running! There's a great tutorial from my friends at Jamie Christina on how to finger knit. The girls had a ton of fun and spent most of the day practicing and trying different colors. The best part was seeing Lily currled up after dinner relaxing with her knitting! Well, I thought that was the best part but then their dad sent me this message the next morning. Both girls were up and making more projects before 8 am! So cute! Follow me on Pinterest to see more fun stuff.